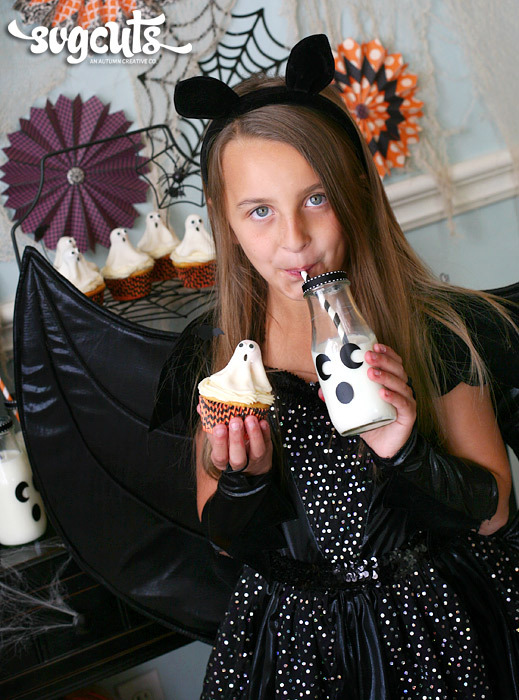 Welcome to my Boo-tastic Halloween Bash! This past four weeks has been filled with AMAZING projects by the SVG Cuts design team, and what better way to end it than with a party? 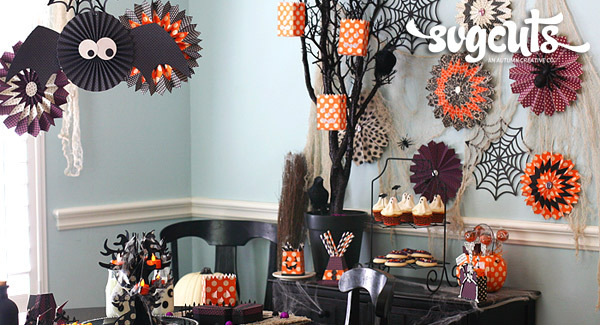 Have you ever wanted to create your very own custom party theme? Not sure where to start? Maybe you get over whelmed at the thought of all the cutting? 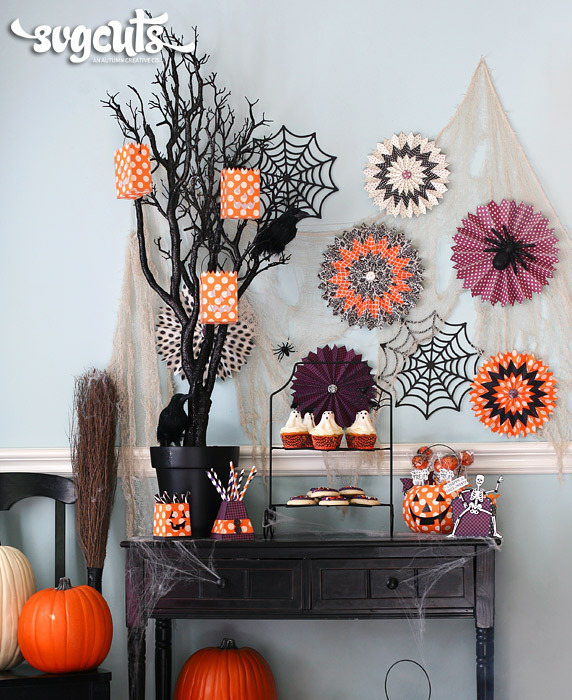 Fear not, you CAN create a party and keep it simple, yet eye-catching and amazing! Take bits and pieces from various kits to make your own one of a kind celebration. 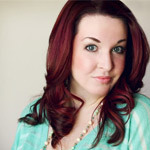 Today I will share with you various tips on what I did for my shindig. Rosettes: Cut as many rosettes as you desire and in various sizes with the Catacomb Manor SVG Kit. 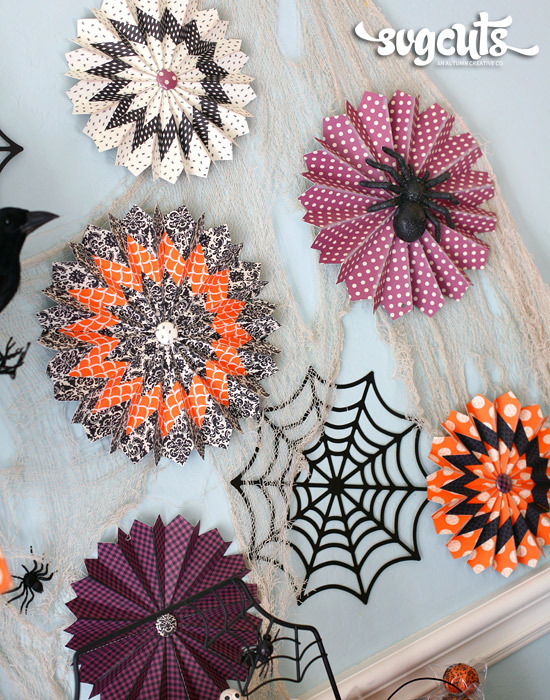 Hang them on the walls with wall putty and hang them from windows, lamps, etc. with twine. Ink edges to cover the score lines for a cleaner look. I added some flair badges to the center of most of my rosettes. Coffin Favor Boxes: Created from the Elmhurst Hollow SVG Kit, these are left VERY simple. I simply cut the boxes and added some glitter ribbon to them. You can jazz them up even more with buttons, glitter, ribbon, or even add your guests names to them! Fun! 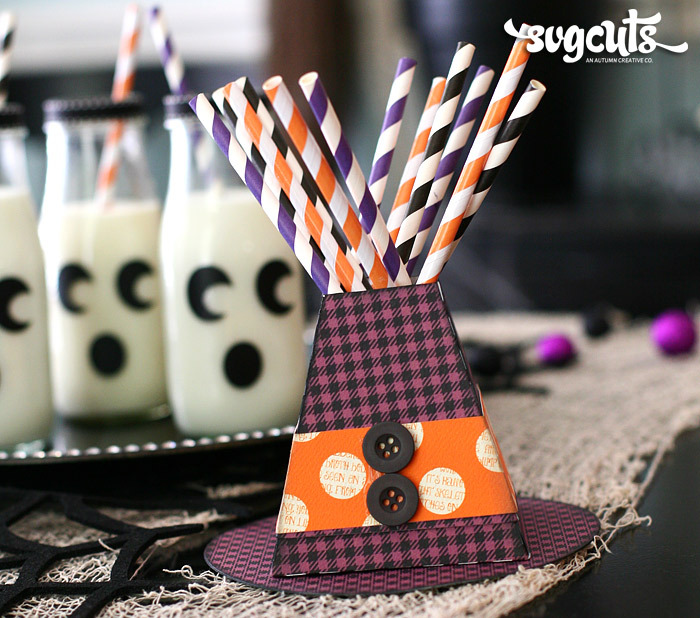 Witches Hat Straw Holder and Jack O'Lantern Candy Holder: These two items were created from the Gimme Candy Boxes SVG Kit. I did make the witches hat slightly larger than normal. For both, you cut the tops right off to create an opening. I also adhered the lids to the bases so they didn't slide off when moving things around. Tombstone Gumball Holder: Again, I used the Gimme Candy Boxes SVG Kit along with the Spooky Soiree skeleton. Simple, but so cute with that skeleton! The skeleton is about 6" tall when finished. 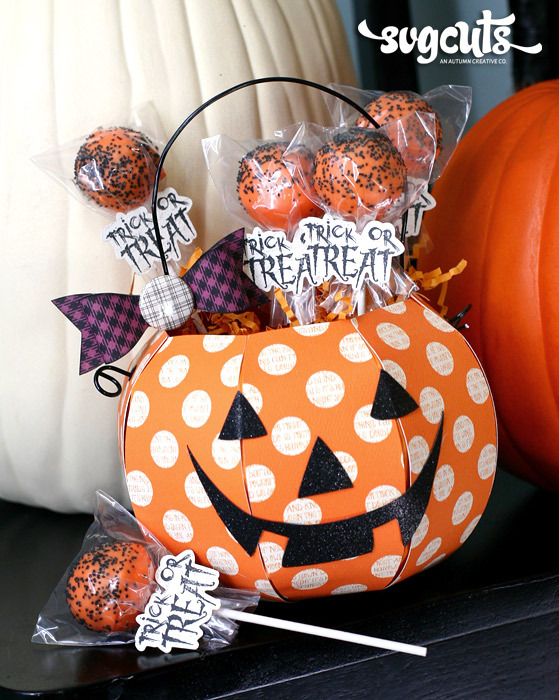 Jack O'Lantern Cake Pop Holder: This is another fun piece. I used the pumpkin from the Bedtime Stories SVG Kit. I re-sized it to make it larger, finished size is about 8" wide. I hot glued a chunk of styrofoam inside the Jack O'Lantern to stick the cake pops into. 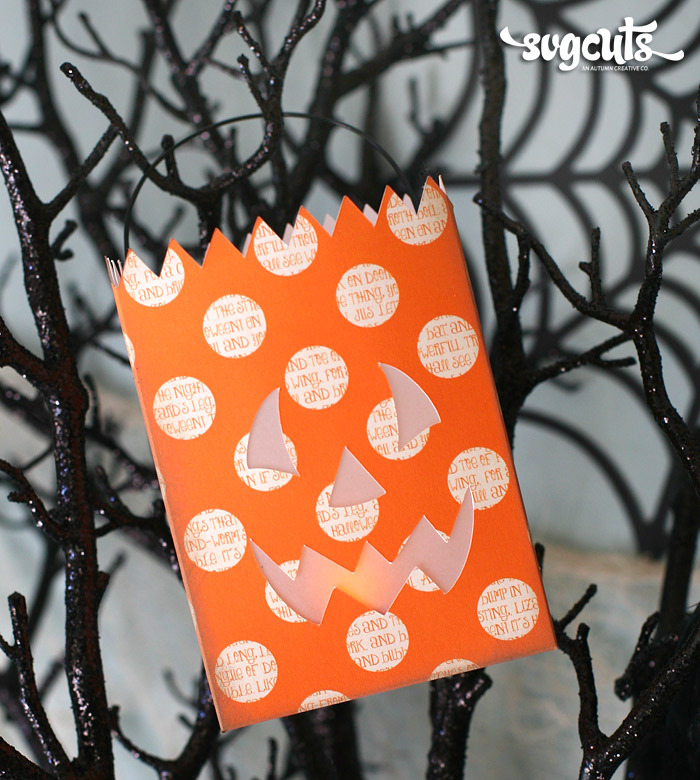 The face is cut from black glitter paper using the Jack O'Lanterns SVG Collection (I used the jack2.svg face). I also added on the 3D bow and flair for a cute touch. Add some black eyelets and wire for a handle so it looks like a trick or treat pail. Add a stamped sentiment to each cake pop. Wire Bats on the Cupcakes: Pretty simple, just cut the bats pretty small (about 1.5" wide) and glue them onto a wire. I thought they would add something fun to those cute ghost cupcakes. Jack O'Lantern Hanging Lanterns: Using a bag from Frightful Friends Treat Sacks SVG Kit and a face from the Jack O'Lanterns SVG Collection I created a simple, yet eye-catching lantern. Line your walk way with these, hang them from trees with wire, etc. They are a simple way to 'brighten' up a party. You can even take the tea light out and use them as favors when you're done. 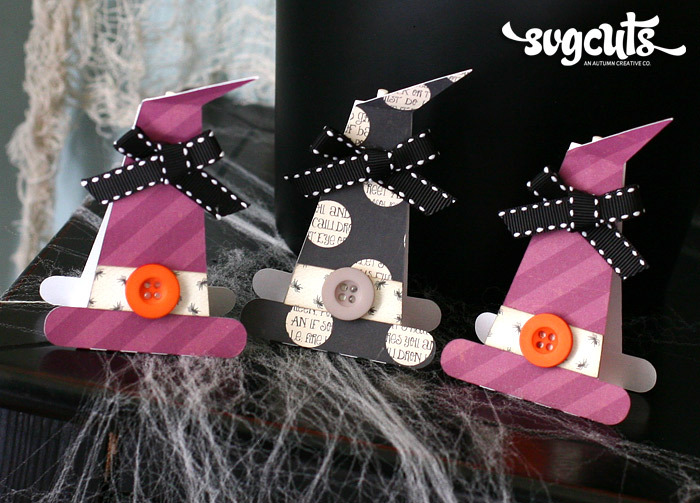 Witch Hat Sucker Holders: I just LOVE these! So simple and cute for favors; what's even better, they are a freebie cutting file! So quick to make, too. Table Fences: I took the fences from Elmhurst Hollow SVG Kit and just cut two of them in grey cardstock, bent them a bit and stood them on the table. 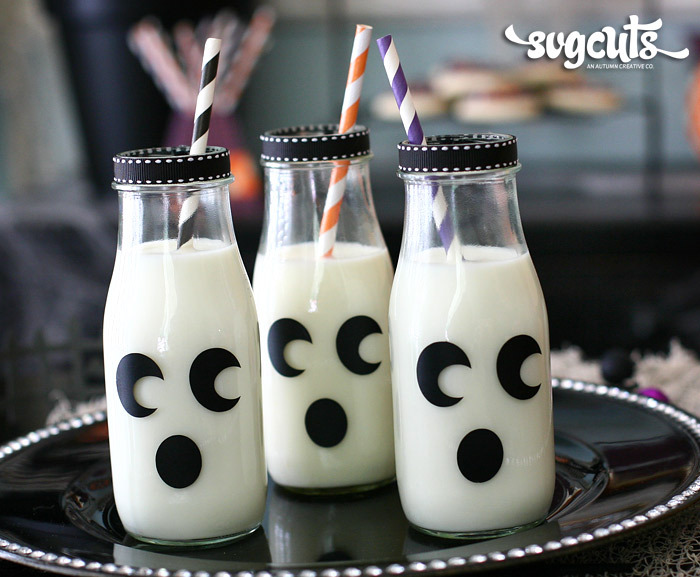 Ghost Milk Bottles: Are these not the cutest? I used empty bottles from Starbucks frappucinos, removed the stickers, and then cut vinyl decal ghost faces for them. What child would not be thrilled with one of these? I used the ghost's face from the Hemlock Cards SVG Kit. Add some ribbon and a colorful paper straw and you're done. Tea Light Tree: Made as-is with the Spooky Soiree SVG Kit. The tree is amazing and makes a fantastic centerpiece! 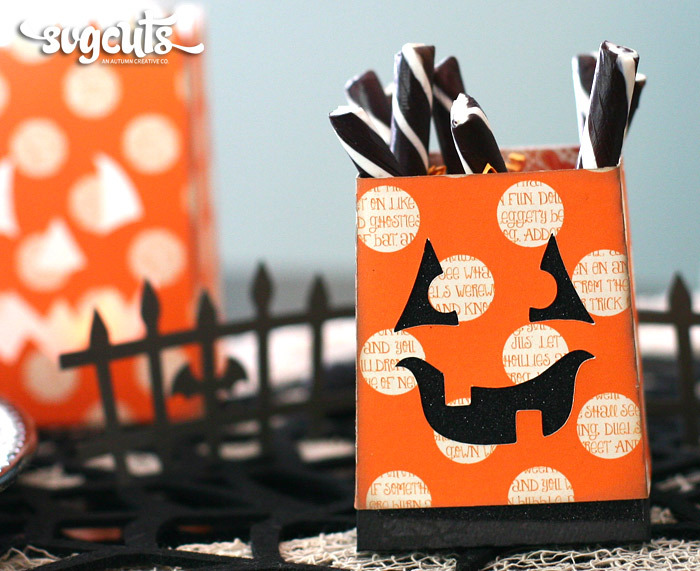 Candy Corn Holder: Simply cut from the Gimme Candy Boxes SVG Kit. I love how easy the box goes together. You can even make one for each guest! Halloween Burlap Banner: I created my own letter stencils for this. 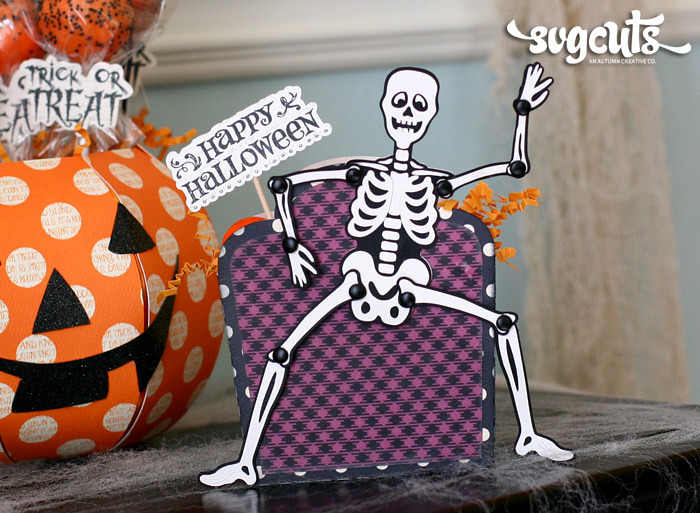 Die cut your stencils and use black paint to dab gently onto burlap fabric pieces. Once dry, sew the banner pieces all together! Easy and so fun so create! 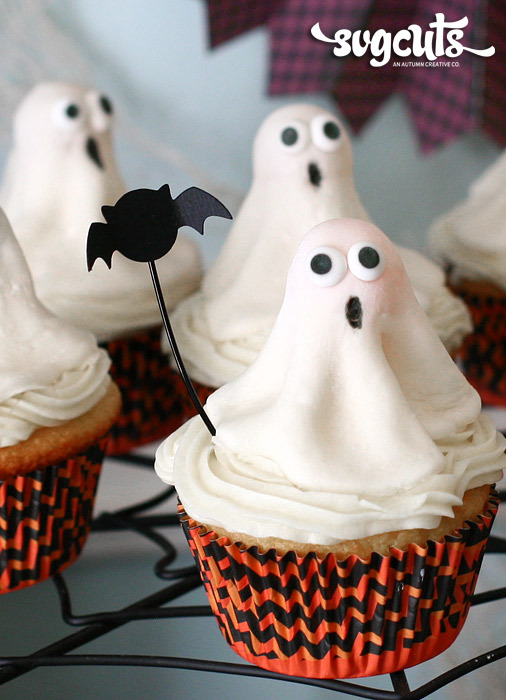 Ghost Cupcakes: Are these not adorable? So simple to create. Bake your cupcakes and add a thin layer of icing. You'll then stick a Dum-Dum sucker into the cupcake. To create the ghosts you can use store bought fondant, or make your own (I made my own marshmallow fondant). Roll it out thin, but not too thin or it'll tear. Cut about a 2.5-3" diameter circle and gently drape over the Dum-Dum. Once 'set' Add candy eyes and use a food coloring maker for a mouth. My kids were AMAZED when they saw these. A win for mom! Cake Pops: Who doesn't love a good cake pop? I use a Babycakes cake pop machine to make the process go faster. A tip when dipping cake pops; Dip a small bit of frosting on the stick, put stick into the cake pop and then freeze for a bit. The candy coating will harden on to the stick and the cake ball and prevent it from falling off while dipping. Be quick! When the cake balls are chilled the chocolate sets very fast. Cookies: I was short on time, so I bought some. Yummy! 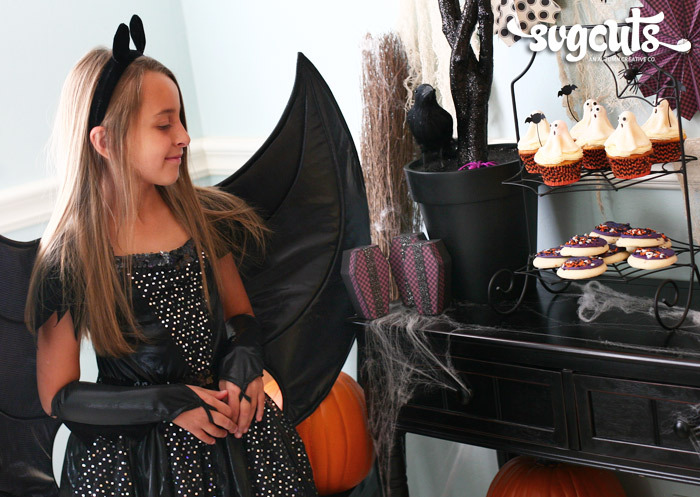 Get various candies to match your party at any party or candy store. Perfectly matched candy makes a big difference! When thinking of a theme for your part, find a color palette you love. Keeping the colors to a minimum will keep the decor flowing nicely. 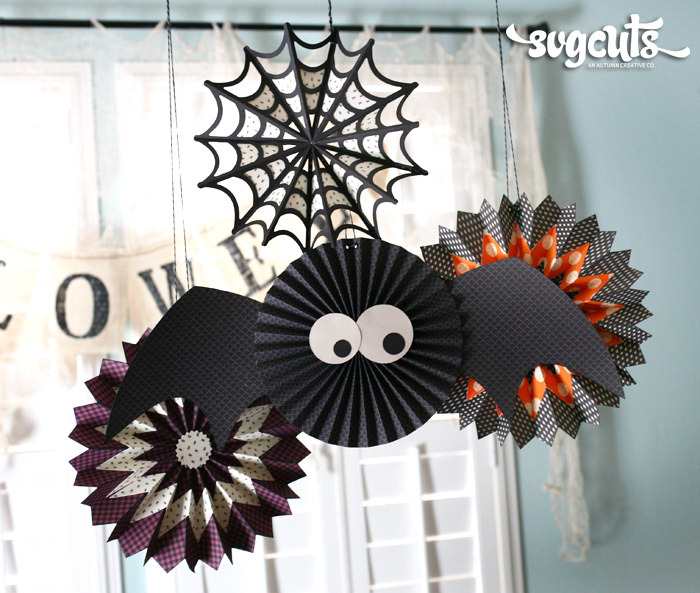 For my party my main focus was rosettes, bats, and spider webs. Using a digital collection is a good idea. You print off the paper designs you want and in as many quantities as you want. If you decide last minute you need to add an extra gift bag etc. No running off to the store in hopes they have the paper you need, just print off another sheet. 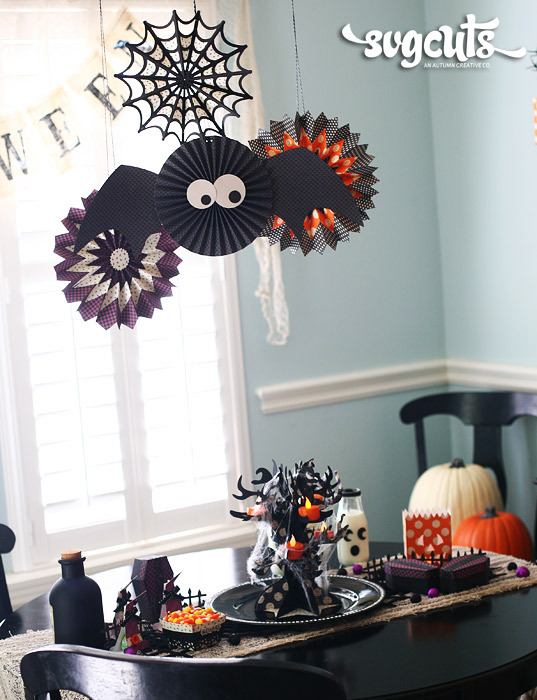 You don't have to go crazy with cutting itty-bitty pieces for decorating, we all know that would be quite time consuming depending on the size of your party. You can just avoid the tiny cutting almost entirely, like I did, or you can go the print and cut route. Adding a few buttons, ribbon, twine, rhinestones, etc. can just the decorations just a little more 'pop' without being too time consuming or expensive. 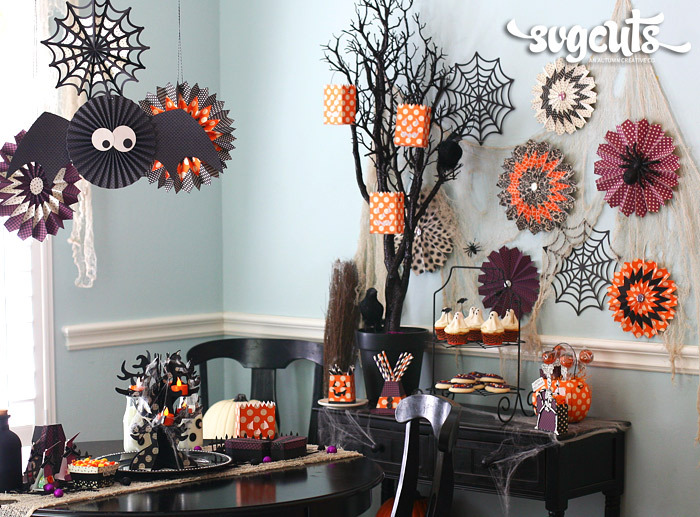 You can take these ideas to an even bigger level with all the amazing kits at SVG Cuts! Cupcake wrappers, boxes.. the ideas are endless! I truly hope you've enjoyed my party! Have you created a one of a kind party featuring SVG Cuts? Do you plan to? Have fun with it and as always, be sure to share it on the SVG Cuts Facebook page and inspire others. Enjoy and thanks for coming! Don't forget to pick up your party favor on the way out! Where’s the party? What awesome decorations! Anyone who attends this party should be in awe of the decorations. Have a SPOOKtacular time!!! Really nice, Tamara! The cardstock you used is perfect! And I love the giant bat! Really an adorable party. 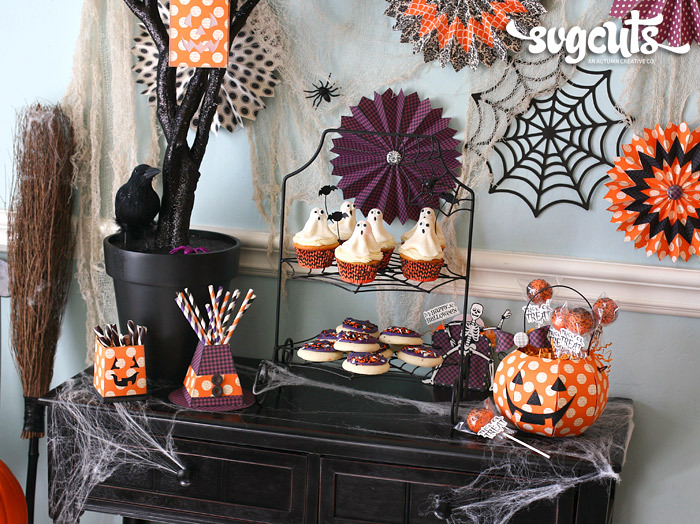 I see so many badly staged “party” or “candy” tables on blogs…This definitely isn’t one of them. Every thing you made is just adorable enough for a kid’s party but also grown up enough to work for a Bunco group or even an adult party. I am I LOVE with the pumpkin you made to hold the cake pops. I have the pumpkin but not the faces- have to buy ANOTHER file I guess. I just can’t stop gushing about this entire display. What file did you use to make the 9″ rosette for the bat’s body? It looks different from the rosette in the Catacomb Manor kit.